What’s the first thing people do when they arrive at their vacation destination? For many, posting about it on Instagram is second only to putting on sunscreen and ordering a drink. If you’re a social media marketer in the travel and tourism industry, consider yourself lucky. While many of your peers in other industries struggle to come up with content ideas or encourage user-generated content, there are over 58 million instances of the hashtag #travel on Instagram and counting. You may already have solid Facebook and Twitter strategies in place for connecting with travelers, handling customer service issues, and promoting your services—but can you say the same for your Instagram account? Many companies are simply posting whatever content they can, when they can (which isn’t a bad place to start). To help you take full advantage of what the platform has to offer, here is a list of Instagram tactics you should be checking off on a daily, weekly, and monthly basis. Start your day off with coffee (obviously) and 15-30 minutes of monitoring time. Set up search streams in Hootsuite to find content from potential new followers who are posting about their upcoming vacation, or sharing photos from one of your destinations. Set up Monitor streams for specific hashtags relevant to your company (a specific city or resort name, #vacationlife, or #needavacation for example) or for posts being sent from a specific location. The TrendSpottr app in Hootsuite can help you easily find top trending photos, videos, and influencers for any tag, topic, or hashtag. Repeat this periodically throughout your day (coffee optional) to stay up to date on all the Instagram action. Instagram isn’t only about the photos you post. No one can tell the story of your brand experience better than your visitors can—after all, they’re the ones living it. Get involved with them by liking and commenting on their photos, and sharing the content they post. The Vidpiq for Instagram app in Hootsuite allows you to monitor and engage with users that are posting in a specific city or location. Use this app to find visitors posting content relevant to your airline, hotel, or destination, and then share the photos on your company’s account. Just make sure you give credit to the individual who posted it originally. 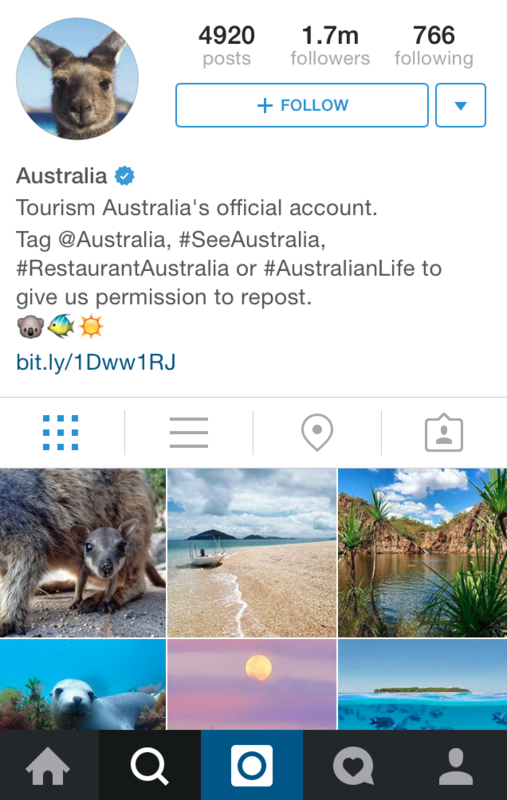 For example, Australia’s official Instagram account notes in its bio that using its official hashtags acts as permission for content to be reposted on the @Australia feed (with credit to the original photographer). Positive reviews and comments on social media are important for any brand, but especially for those in the travel and tourism industry. According to recent research from Deloitte, 49 percent of travelers say that review sites have the most influence on their booking decisions. Not proactively seeking out and addressing negative posts on social media can cause a small issue to spiral into something much bigger and potentially damaging for your brand. While many companies in the travel industry offer support on Twitter and Facebook (KLM airlines, for example, offers 24/7 customer service on social), many aren’t offering the same level of customer service on Instagram. Since Instagram’s direct messaging service focuses around photo content (no surprise there), it can be harder for companies to move customer service discussions into private direct messages. You’ll have to address negative comments out in the open where you find them. Be proactive, be transparent, and offer a solution—even if that solution is an email address where the conversation can continue. Once a week, you should be updating your overall content calendar with at least three Instagram posts for the week ahead, leaving room for any real-time opportunities that arise. Now that Instagram has been fully integrated into Hootsuite, you can schedule posts to Instagram for the week from the same dashboard you use to manage your other social networks. Consistency is one of the best ways to grow a strong community on Instagram. Try having one consistent post each week—for example, a post featuring a different shot from your hotel or destination tagged with the #WanderlustWednesday hashtag. JetBlue does this on Fridays, posting a #DestinationFriday photo each week. Fairmont Hotels takes advantage of this weekly content as well, by posting #WeddingWednesday photos that feature venue spaces on Fairmont properties and services related to weddings and receptions. Seasonal events and holidays offer the best opportunities for planning creative social campaigns, especially for travelers. At the end of each month, have a look at the month ahead and identify any themes or holidays coming up that you can capitalize on. The internet loves to celebrate obscure holidays such as “National Best Friend Day” (June 8) or “National Pizza Day” (February 9). Plan ahead and create a piece of content for social media about tips for traveling with your best friend or where to eat the best pizza in Italy. Also, look at any upcoming marketing campaigns and think about how Instagram can be integrated into them. If you have a contest coming up, for example, consider adding another entry mechanism via photos posted to Instagram with a specific hashtag. Herschel’s #WellTraveled hashtag contest on Instagram performed so well, it’s now a part of the company’s regular content marketing and social media strategy. This user-generated content can then be pulled into a branded social gallery using Hootsuite Campaigns. These galleries can be displayed on microsites, Facebook, your own website, or on screen at an event to connect social experience with live interactions. Proving the ROI of your efforts on Instagram is just as important as any other platform you use to promote your business. Monthly reporting will help you identify what’s working and how you need to adjust your strategy, and it will allow you to demonstrate how your efforts on Instagram are positively affecting the business. Set strategic goals for Instagram that complement your overall business and marketing objectives. For example, if one of your main marketing goals for the month is to increase bookings for a certain destination or resort property, offer your Instagram followers an exclusive discount code (either as text on a photo you post or as a clickable link in your bio). Tracking the number of times that code is used can help you demonstrate Instagram’s effectiveness. The common thread between each of these checklists is purpose. Know what you want to achieve on Instagram, and ensure every action you take and piece of content you post is working to help you achieve it. For more resources about developing an effective Instagram strategy, check out our free Instagram Master Tactics guide and this on-demand webinar that features Instagram tips and strategies from Travel Alberta, a destination marketing organization that has achieved amazing growth and results on Instagram. Hootsuite will be attending at the Social Media Tourism Symposium (#SoMeT15US) on October 14 and 15 at Harrah’s Theater in New Orleans. SoMeT is the premiere global conference for destination marketers who want to learn from world-class leaders and innovate within their industry.